This exceeded my expectations. Simply the best hot and cold water dispenser we've tried. 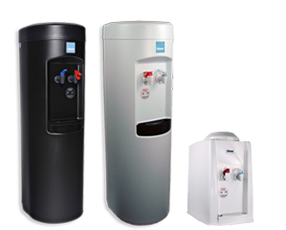 Not sure if our water coolers are right for you? Check out what our customers are saying. Nice and compact, saved me lot of room in the fridge! My daughter has become much more eco-friendly and mentioned we should get a water cooler rather than go through all the plastic bottles that we did...this water cooler has done that for us and much more! We have a lot more room in our refrigerator now, but now I can make my hot tea in seconds and fill my water bottle to excercise at the same time. Plenty cold enough for the price and the hot water is really hot which I love. I looked across the websites for the best price & reviews and this lives up to everything I have read. You will not be disappointed. Love this unit! Our staff is thrilled with our new Clover water dispenser! The cold water is cold and the hot water is hot enough to have a nice cup of tea. It was easy to set up, easy to load bottles onto, and is an attractive addition to our work kitchen area.